There are few pitching feats as grand as a no-hitter. Still, it is not as rare as the Immaculate Inning. An Immaculate Inning is when a pitcher records three straight outs, via strike outs, using nine consecutive strikes during a single inning. 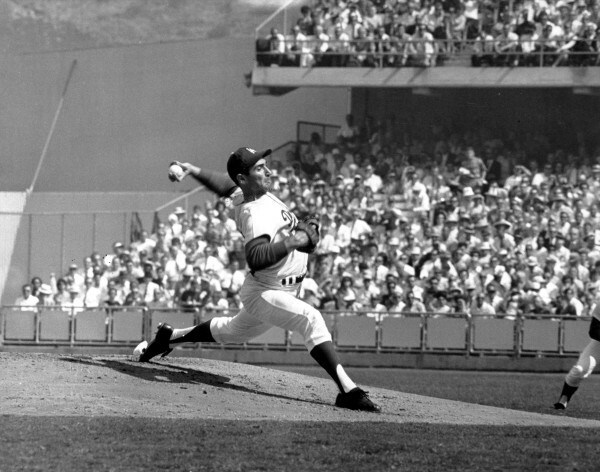 It has been done only 80 times, and today marks the third time Sandy Koufax had accomplished the deed. It happened on April 18, 1964 against the Cincinnati Reds. Koufax, in his second start of the season, faced off against Leo Cardenas, Johnny Edwards, and Jim Maloney in the third inning, and quickly sent them to their seats. Unfortunately, Koufax's next inning wouldn't be as good. He would give up a three-run homer in the fourth, and eventually lose the game 3-0 (boxscore). Regardless of that result, Sandy would set a record that has yet to be beat. He is the only pitcher to record three Immaculate Innings in his career, and he would do it over three consecutive years. His first happened on June 30, 1962 against the Mets, but would be understandably overshadowed due to his completion of his first no-hitter that evening. BTW, in the first inning he struck out Richie Ashburn, Rod Kanehl and Felix Mantilla on nine consecutive strikes. The following year he would do it again. This time against the Houston Colt .45's on April 19, 1963. In the fifth inning of this game he would strike out Bob Aspromonte, Jim Campbell and Turk Farrell. Check out a complete list of Immaculate Innings, via Baseball Almanac, here. BTW, today also marks several other Dodger moments in history. Charles Ebbets would pass away on this date in 1925 at the age of 65. Dodgers scout Burt Shotton would replace Leo Durocher as Manager on this date in 1947. Durocher had been suspended by Commissioner Happy Chandler for acts "unbecoming to a major league manager" ten days prior. In 1952, during the Opening Day game in Brooklyn, Giants outfielder Willie Mays would be knocked unconscious when he hit the Ebbets Field wall on a seventh inning drive by Bob Morgan with the bases loaded and two outs. Mays had caught the ball to record the last out of the inning. In 1958 the Dodgers played their first home game in Los Angeles at the Coliseum. A crowd of 78,672 were in attendance. In 1966 Maury Wills would not only be the first batter but also record the very first hit on artificial turf against the Houston Astros at the Astrodome. In 2008 the Dodgers announced that Joe Biemel was chosen by fans to be the mystery fan chosen bobblehead that season.